FREDERICK, Md. (WUSA9) -- An overturned dump truck has snarled traffic on a busy road in Frederick, Md. Maryland State police say the dump truck overturned on Route 15 at the 7th Street overpass. Hazmat crews have been sent to the accident, but there is no information regarding injuries or a possible fuel spill. FREDERICK, Md. (WUSA9) -- A Frederick man pleaded guilty Wednesday for his role in the Frederick High School shooting that occurred on Feb. 4th. Chandler Tristan Davenport, 20, pleaded guilty to two counts of reckless endangerment. His plea was accepted under the condition that he testifies against the alleged shooter. Davenport will be sentenced on Nov. 24th. A 10-year sentence is recommended for Davenport with nine years suspended, if he testifies. If that is the case, police say he would spend a year at Frederick County Detention Center. FREDERICK, Md. (AP) - Flying Dog Brewery says it's considering building a new plant in Frederick to increase production capacity sevenfold. The locally based company said Tuesday it's negotiating to buy 31 acres from the city near the Frederick Municipal Airport. Flying Dog says it has submitted a contract for the property at the city's asking price of $2.5 million. The entire project will cost $50 million. Flying Dog says the new plant would be capable of producing 700,000 barrels a year, compared with 100,000 at its existing plant south of Frederick. The project would create 150 jobs. The company currently employs about 100 people. The company says it must expand to meet the demand for its beer, which is sold in 26 states and 14 countries. FREDERICK, Md (WUSA9) -- The Frederick County Council voted 4-3 Tuesday night to repeal a divisive 2012 ordinance making English the county’s official language, capping off a long battle over what the measure accomplished, and what it said about the community. County Council President Bud Otis, a Republican, joined with three Democrats in voting to repeal the ordinance, over the objections of his fellow Republicans and a community contingent that included a representative from a national pro-English language group. FREDERICK, Md. (WUSA9) -- A man was arrested after police say he pushed a man from behind and robbed him in Frederick Friday. Leondre Curry was arrested in connection with the robbery, police said. At approximately 7:30 p.m., police say a man flagged down an officer and told the officer that he was just robbed in the area of Hillcrest Drive and Arwell Court. After the victim provided a description of the suspect, police were able to identify the suspect as Curry. Police say officers found the victim's stolen property in Curry's pockets. FREDERICK, Md. 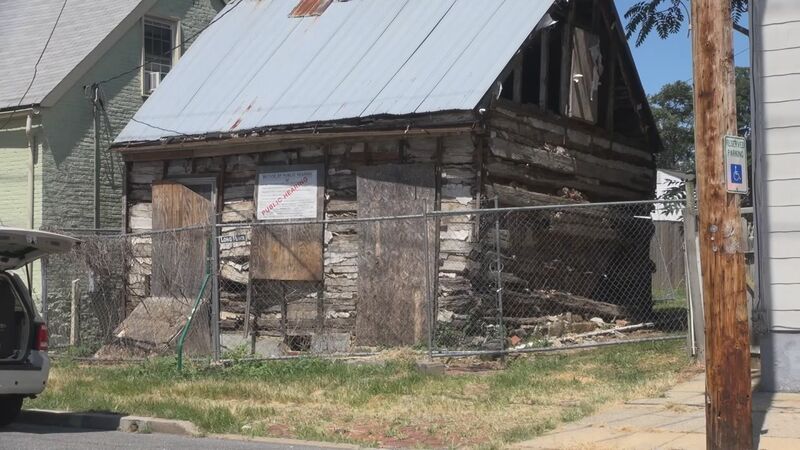 (WUSA9) -- A public hearing Thursday night opened the door to potentially demolish a crumbling 200-year-old log cabin on East 5th street in Frederick that critics say is beyond saving and has become a serious safety hazard. "I'm a little nervous standing here," Billy Shreve, Frederick County Commissioner said. FREDERICK, Md. (WUSA9) -- A man was arrested early Sunday after police say he struck a person in the face with a beer bottle inside of a Frederick bar, according to the Frederick Police Department. Byron Scott Speak of Frederick, Md. was charged with first and second-degree assault, police said. At approximately 1:37 a.m., police say officers were flagged down by a staff member of JoJo's Restaurant and Bar located at 16 E Patrick Street. The staff member informed police that an assault had occurred inside. Police say Speak told officers that he struck a patron's face with a glass beer bottle. Speak was arrested after officers observed a severe cut to the victim's face. Police say the victim was taken to Frederick Memorial Hospital with non-life threatening injuries.